A low platelet count, medically known as thrombocytopenia, is a health disorder in which your blood has a lower than the normal number of platelets. Platelets are the smallest of the blood cells that aid in blood clotting by forming plugs in blood vessel holes. The platelets circulate in the blood with an average lifespan of 5 to 9 days. A normal platelet count in a healthy person ranges from 150,000 to 450,000 platelets per microlitre of blood. When the count is below 150,000 per microlitre, it is considered a low platelet count. Presence of platelets in the spleen due to cancer or severe liver diseases. This causes a decrease in the number of platelets in circulation. 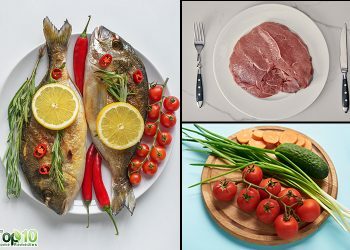 Reduced production of platelets due to leukemia, some types of anemia, viral infections, exposure to toxic chemicals, chemotherapy drugs, heavy alcohol consumption and deficiency of essential vitamins like vitamin B12. Increased breakdown of platelets due to autoimmune diseases, reaction to medicines, bacterial infection in the blood, pregnancy and health problems like idiopathic thrombocytopenic purpura (ITP) and thrombotic thrombocytopenic purpura (TTP). The telltale signs of a low platelet count are easy or excessive bruising, prolonged bleeding from cuts, spontaneous bleeding from the gums or nose, blood in urine or stools, and skin rashes due to superficial bleeding into the skin. Women may experience unusually heavy menstrual flows. People with low platelet counts may also complain of malaise, fatigue and general weakness. With certain lifestyle changes and some easy-to-follow home remedies, you can quickly improve your platelet count and live a healthy life. Continue any of these remedies until your platelet count is restored to normal. If the problem is severe then consult your doctor. Here are the top 10 ways to increase a low platelet count naturally. Both the papaya fruit and its leaves can help increase a low platelet count within just a few days. In 2009, researchers at the Asian Institute of Science and Technology in Malaysia found that papaya leaf juice can increase the platelet count of people diagnosed with dengue fever. Eat ripe papaya or drink a glass of papaya juice with a little lemon juice 2 or 3 times daily. You can also pound a few papaya leaves without the stalk using a pestle and mortar to extract the juice. Drink 2 tablespoons of this bitter juice 2 times a day. According to a 2011 study published in International Journal of Universal Pharmacy and Life Sciences, wheatgrass can be beneficial in increasing platelet count. 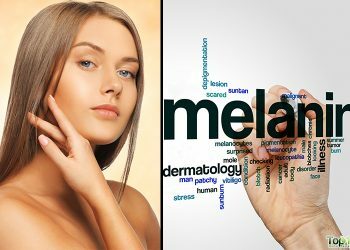 In fact, it can produce significant increases in hemoglobin, red blood cell, total white blood cell and differential white blood cell counts. This happens because wheatgrass is high in chlorophyll with a molecular structure almost identical to the hemoglobin molecule in human blood. Simply drink ½ cup of wheatgrass juice mixed with a little lemon juice daily. Pumpkin is another helpful food to improve your low platelet count. It is rich in vitamin A that helps support proper platelet development. It also regulates the proteins produced in the cells, which is important to raise the platelet level. In a ½ glass of fresh pumpkin juice, add 1 teaspoon of honey and drink it 2 or 3 times a day. Also, include pumpkin in your diet by adding pumpkin puree to soups, stews, smoothies and baked goods. Spinach is a good source of vitamin K which is often used to help treat low platelet disorder. Vitamin K is required for proper blood clotting. Thus, it reduces the risk of excessive bleeding. Boil 4 or 5 leaves of fresh spinach in 2 cups of water for a few minutes. Allow it to cool, and mix in 1/2 glass of tomato juice. Drink it 3 times a day. Also, enjoy this green vegetable in salads, green smoothies, side dishes or soups. To increase your platelet count, you need to increase your intake of vitamin C, also known as ascorbic acid. A study published in 1990 in the Japanese Journal of Hematology stated that vitamin C improves platelet count. Being a powerful antioxidant, high doses of vitamin C also prevent free-radical mediated damage of the platelets. Your body requires 400 to 2,000 mg of vitamin C per day, depending on your age and overall health. Eat foods high in vitamin C like lemons, oranges, tomatoes, cantaloupes, kiwi, spinach, bell peppers, and broccoli. You may also take vitamin C in supplement form daily, but only after consulting your doctor. 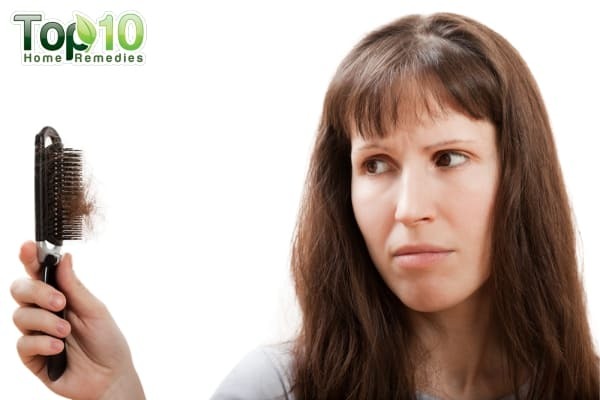 A popular Ayurvedic remedy to raise your platelet count is Indian gooseberries, also known as amla. The vitamin C in amla can help increase the production of platelets and boost your immune system. Eat 3 to 4 gooseberries on an empty stomach every morning. Alternatively, mix together 2 tablespoons each of amla juice and honey. Drink it 2 or 3 times daily. You can also eat homemade jam or pickles made with fresh Indian gooseberries. This cold-pressed oil is also beneficial in increasing your platelet count. Sesame oil has properties that can raise platelet level naturally. It reduces free radical damage, inflammation in the body and helps improve blood circulation. 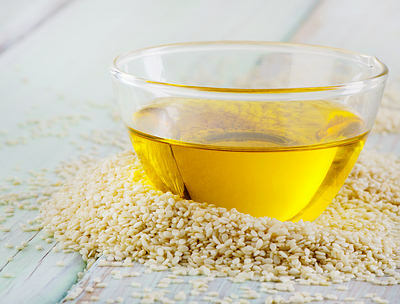 Drink 1 to 2 tablespoons of high-quality sesame oil twice a day. You can also rub some sesame oil externally on lymph node areas several times daily to help increase platelet counts. In addition, use cold-pressed sesame oil for cooking. Eating beetroot is another popular dietary method of increasing the platelet count. Being high in natural antioxidant and hemostatic properties, beetroot can raise your platelet count within a few days. Drink 1 tablespoon of fresh beetroot juice 3 times daily. Another option is to mix 3 tablespoons of beetroot juice in a glass of carrot juice and drink it 2 times daily. 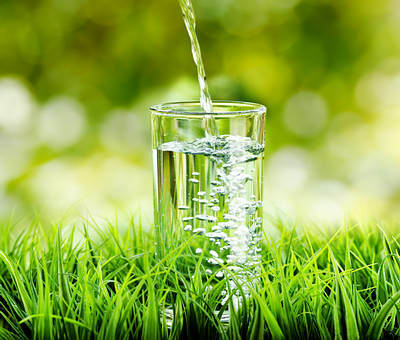 Blood cells are made of water and protein, hence it is highly recommended to drink plenty of water throughout the day. When it comes to a low platelet count, avoid drinking cold water as it can affect your digestive tract and the body will not absorb nutrients properly. Instead, drink filtered and purified water that is room temperature. This will help your body produce more blood cells and eventually improve the platelet count. Drink at least 8 to 10 glasses of room temperature water daily. Regular exercise will boost blood circulation, improve your immune system and lead to an increase in platelets. When platelets are 15,000 to 20,000, you can perform sitting or standing exercises, gentle stretching and walking. When platelets are 20,000 to 40,000, you may use some light resistance like weights or elastic tubing or latex bands. You can also do brisk walking. When platelets are 40,000 to 60,000, you may perform activities like stationary cycling and golfing. 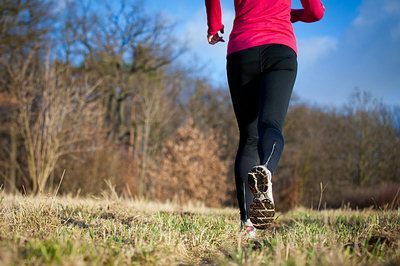 When platelets are above 60,000, you may do aerobic exercise like biking or jogging. Note: Avoid all types of exercises when your platelet count is less than 15,000 as it may increase the risk of bleeding. Limit alcohol intake as it can hamper production of platelets in the bone marrow. Also, avoid tonic water as the quinine in it can contribute to decreased blood platelet counts. Avoid eating raw vegetables when your platelet count is low as it may damage the intestinal lining. Instead, steam vegetables until soft and then eat them. Eat 1 to 2 red guavas daily to improve the platelet count. Foods that act as blood purifiers like aloe vera must also be included in your diet. 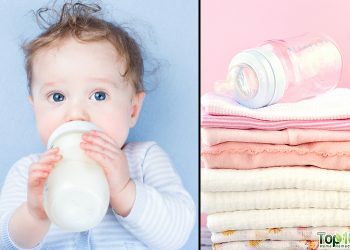 Avoid all dairy products, including milk, yogurt, cheese, and butter, for a few days as these products can contribute to mucus formation and worsen some autoimmune diseases. Avoid canned and processed foods that do not offer many nutrients. Get at least 7 to 8 hours of sleep per night to help your body recharge and produce more platelets. Eat whole-grain cereals, brown rice, and whole-wheat products. Avoid white flour, white rice, and processed foods. Avoid activities that may cause injuries. Ask your doctor before taking over-the-counter medications as some medicines may affect your platelet function. I have also platelet count is too low between 30000 to 65000 i drank papaya leaves juice alternative days but no result till now iam drink that juice. 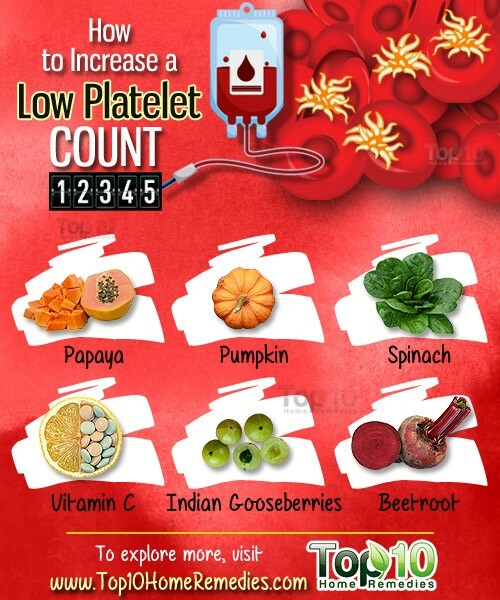 Platelet count and Blood can be increased by the fruits, and vegetables. gooseberry are useful for the increase of the R.B.C. , W.B.C. , plasma , platelet. 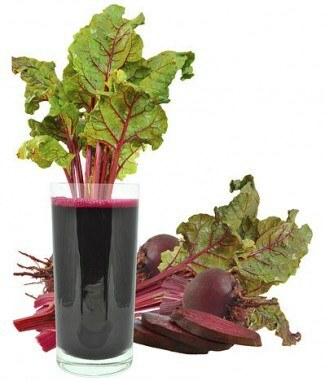 Beet Root increase the blood and thins the blood.